The second film dug out of the Junkyard is Mega Piranha, one of the more recent Asylum releases, from April 2010. It seems a bit has changed in the development of Asylum movies over the years, as any slow pacing issues that their older movies may have had are not apparent here. No sir, this movie moves faster than the titular creatures do. We go from meeting the Piranha in a stunning display of violence to a mad dash to save the world from the ever-growing fish menace. “Wow” was a word heard multiple times while watching this both from my wife and myself. Going into this knowing the reputation The Asylum has, it was expected to be a B-grade movie, but there were so many moments of true disbelief and surprise that “Wow” was all that could be said. 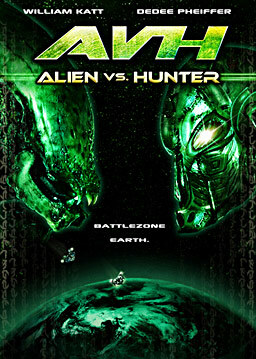 Here we go everyone, the first movie to be pulled out of the junkyard is AvH: Alien vs. Hunter. Jeanne & I watched this one together on a quiet January night and it was quite an interesting feature. This Asylum-produced movie was made apparently in response to the big budget, but poorly received Alien Vs Predator: Requiem by Fox. The movie centers on a group of survivors attempting to escape the carnage of the Alien and Hunter, after two objects crash land in a small mountain town. For the first half of the movie, the plot sticks pretty close to that of AvP:R, but after the cast go on the run for help the movie stand out on its own. Many comparisons will obviously be drawn to AvP:R, but this Direct-to-DVD “Mockbuster” surprisingly has more character development than the big-budget film. You actually get a sense that a few of the characters are more than bodies to pad the creature’s kill count. William Katt stars in the film as Lee Custler, a journalist who is down on his luck, and is one of the reasons I was excited to see this flick. I loved Katt in House (1986) another film that may show up in the Junkyard someday, since it sadly has never gotten the attention it deserves as a B-style campy horror film. A few shocks and twists may take you by surprise, but otherwise the movie is a pretty straightforward affair.